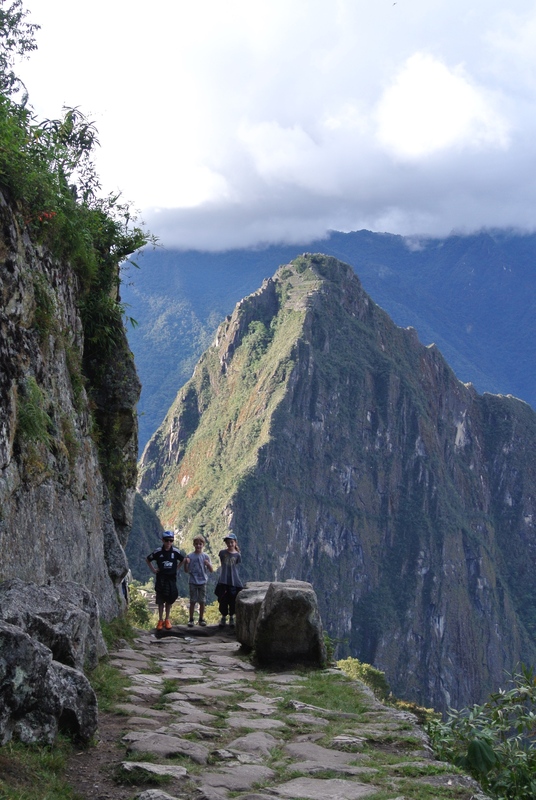 Our alarm goes off at 4am – our intention is to get up early and hike to the Sun Gate to watch sunrise over Machu Pichu. It’s 4am, it’s dark and it’s absolutely pouring with rain – as it has been all through the night. It takes us about 2 seconds to cancel that plan and roll over back to sleep. To be fair, the three large pisco sours we had the night before may also have influenced our change of heart. At breakfast we discover the first technology glitch of our trip. Some film clips from the Galápagos are not showing up in the draft films we had built. One clip was particularly special – it captured a seal playing in the water near us as we swam and then you see him snapping his teeth at us…. all a little too close for comfort. Our hard drive was getting full and we conclude that my *emptying the trash* the night before must be the culprit. Bugger. We panic – buy some trash retrieval software – and try and locate the files. The short version of this story is that after several hours of trying… we fail to retrieve most of the missing film clips. A big lesson is learnt and we promise to buy ourselves a larger backup drive on arrival in Santiago. Our drop box backup strategy was simply not working – we had underestimated the size of our daily backups plus the poor connection speeds we’d be getting. Hoping that our day gets better, we head off on our second trip to Machu Pichu – still with the goal of reaching the Sun Gate. While we’re in the valley, it starts to rain. We realise we’ve forgotten Mia’s coat… so we head back. Got the coat. We head off to Machu Pichu. We get to the bus. We realise we’ve left the bus tickets behind… so we head back. Got the tickets. We head off to Machu Pichu. We get half way to the bus. We realise we’ve left the GoPro in the restaurant where we had lunch. (I’m considering giving up on the day and just heading to the bar. Pisco Sours suddenly seem the way forward.) Got the GoPro. Thank you, thank you, thank you lovely restaurant staff. We head off to Machu Pichu. It’s now so late in the day, the bus crowds are gone and we have our own personal bus ride all the way to the top. Onwards and upwards to the Sun Gate! The trail is mostly in the shade, uneven, narrow in places with several steep drops off to the side. While we’re catching our breath half way up we spot two bears crossing the path just behind us. Albeit exciting, I’m desperately trying to recall the ‘bear rules’ we learnt over 15 years ago in Canada. Luckily they’re not interested in us and they head off into the bushes. With a whole lot of cheerleading, several water stops, some bribery for one particular member of the team, (Bruno Mars playing on my iPhone and the promise of ice cream at the bottom), we finally make it to the top. Many other hikers had overtaken us on the way and many had been privy to our need for motivational speeches, bribery and coercion. When we finally reach the Sun Gate we are welcomed with a round of applause and several “bravos” from the other hikers who are now sat, taking in the view. Ours were the only children we saw on the hike up to the Sun Gate and several guides come and give them commendation for their achievement. We see the Inca trail from the other side of Sun Gate and watch as several hikers near the end of their much tougher, four day hike. The weather is kind to them and they are welcomed with a totally clear and stunning view out over Machu Pichu City – I watch as a couple of them crack open a beer. Down is much easier, particularly as everyone is on a high from their achievement. We stop off at Machu Pichu City for a few more photos at dusk. The archaeologists have left for the day, their endless repair work on the walls paused for another day and we hear the wardens blow their whistles. It’s time to make our way out. Back down the valley to Aguas Calientes where we’re welcomed back with a downpour and a rainbow. 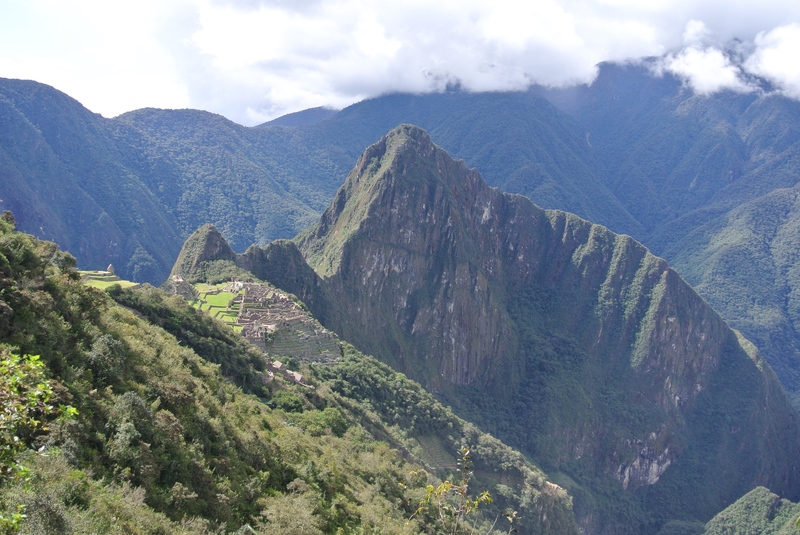 Take a look at our Machu Pichu film. – You don’t need to pre-book a tour guide. There are several English speaking guides by the entrance gates waiting to be hired. – You need your passport to get into Machu Pichu City. – You can stamp your passport with a Machu Pichu stamp on the way out. – Remember sun cream, raincoats and bug spray. Bears! no one mentioned bears!